Don’t hurry to your ski resort. Instead, leave the day before, enjoy a night in Paris, and have a more relaxing journey to your destination. If you arrive from the USA, stay the night in Paris and then head out early in the morning toward your ski resort. If you travel to the French Alps from the UK, think differently. Most people think of this route as a way to get out of the country as quickly as possible. Try rail travel instead of hitting up the airport. Numerous TGV trains leave Paris each morning bound for all corners of the French Alps. Although you can't start out from London on Eurostar the same day and catch these trains, you can head to Paris the night before and stay over in a hotel. By doing this, you can enjoy some of Paris and still arrive at your resort earlier than you would have done if arriving on the same day. In many cases, arriving in a resort around midday means that you can sneak out for an afternoon on the slopes, too. 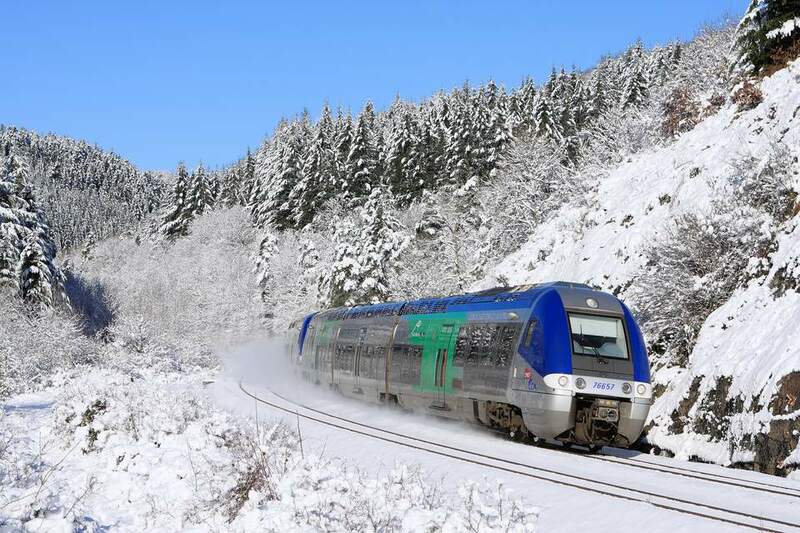 For skiers with vacations starting on a Sunday in the popular Tarentaise region of the French Alps, stopover journeys are particularly useful because there is no Sunday-to-Sunday daytime Eurostar Ski Train service. For all of these Paris stopovers, depart from London St Pancras to Paris Gare du Nord by Eurostar (choose your most suitable train time), and stay over in Paris. Then, follow the guidelines listed for each destination. Sitting in the middle valley of the vast Three Valleys ski area, surrounded by its own varied local slopes, Méribel offers an incredible range of on and off-trail terrain. From the center of the village, the lifts shoot off in all directions, making the resort a great base from which to explore: Courchevel to the east, Val Thorens to the south, and St. Martin and Les Menuires to the west and southwest. The whole Three Valleys is your oyster from here. Much of Méribel’s accommodation is in traditional chalet style, making the place very pleasant to the eye. Further down, there’s the rustic traditional Savoyard village of Les Allues, with its old farmhouses. Another option for good slope access is quiet Méribel Village as well as hotels, apartments, and chalets in Méribel center. There are also abundant apartments in Méribel Mottaret. Getting there: The following morning, take the TGV from Paris Gare de Lyon and arrive at Moutiers. From there, it’s about 20 to 30 minutes by bus or taxi. Val Cenis is a resort in the beautiful Haute Maurienne valley, with spectacular, scenic ski terrain, on the Italian border south of Val d’Isère. Many British skiers haven’t heard of it, but in-the-know French families love this place—and with good reason. There are excellent, varied trails and fairly reliable snow—with most slopes facing north. It’s ideal for children and families, with high-altitude beginner runs that mean even those just starting out can feel the exhilaration and enjoy the views. Termignon and Lanslevillard have excellent beginner slopes right by the villages too, the latter with long green trails that run the length of the lifts. The resort recently took a small step upmarket with the opening of its first 4-star hotel, in addition to a variety of high-quality self-catering residences that are already there. Getting there: The following morning, take the TGV from Paris Gare de Lyon and arrive at Modane. From there, it’s 30 minutes by bus or taxi. In the heart of the Paradiski area, is Peisey-Vallandry. The resort might be far less famous than its neighbors, Les Arcs and La Plagne, but it has plenty to offer, particularly to families and groups. The Peisey village itself is full of traditional charm, with old working farms, chalets, and a Baroque church. The skiing here suits intermediates particularly well. Panoramic views take in the valleys of the Isère and Ponturin rivers, and the child-friendly nature of the villages and slopes make it popular with families. There are plenty of large, beautiful, old wooden chalets, many of them run by small independent companies. There’s also a Nordic ski area on the gateway to the Vanoise National Park. These trails, mostly in the forest, crisscross the Rosuel plateau and pass through picturesque villages and hamlets. Getting there: The following morning, take the TGV from Paris Gare de Lyon and arrive at Landry. From there, it’s about 15 to 30 minutes to the resort’s villages by bus or taxi. Saint Gervais-les-Bains has a relaxed vibe, both on- and off-slope. The ski area, shared with neighboring Megève, has sizeable terrain and beautiful scenery overlooking Mont Blanc. The slopes tend to remain pretty quiet—a special plus for those who love accessible powder, which often remains untracked longer than at other resorts. The altitude of the skiing isn’t that high, but the terrain is on grass-covered slopes (as opposed to rock) makes great skiing as soon as the snow falls. There are plenty of cozy mountain restaurants, including Sous les Freddy’s. In the evenings, you won’t really find people partying, but you might find them heading out for a nice chilled drink. Off-slope activities include horseback riding, snowshoeing, and paragliding. You can also go for a soak at the natural spa center—Les Thermes de St Gervais. Getting there: The following morning, take the TGV from Paris Gare de Lyon and arrive at St Gervais. From there, it’s 10 minutes by bus or taxi. Serre Chevalier, in the Southern Alps, has a friendly unpretentious ambiance that has given it a loyal following. The resort has pretty, tree-lined trails and charming, well-priced restaurants —both on and off the mountains. Serre Chevalier’s ski area has more trees than many others—even at high altitude—and 80 percent of the ski area is higher than 3,200 feet. There are 150 miles of trails, so it’s a big area, and if you are a good skier and went for it, non-stop, it might still take you a couple of hours to go from one end of the resort to the other. This is an excellent resort for first-timers and families because there are dedicated beginner zones at each village and plenty of childcare facilities, so even toddlers are entertained. Getting there: The following morning, take the TGV from Paris Gare de Lyon and arrive at Oulx. From there, it’s 50 minutes by bus or taxi. As the highest ski resort in Western Europe, nestling at 7,500 feet above sea level, Val Thorens is an increasingly swish ski-in-ski-out village, which has seen an influx of upmarket hotels and restaurants in recent years. The latest, La Datcha, is the first building in a ski resort to be built entirely using "Passivhaus" approved eco-friendly construction. The skiing is endless here, with the resort well located in the Three Valleys ski area. Recently the resort’s slope-maintenance team created the "Ski Flux" system, giving skiers real-time information about how busy the runs are. And there’s plenty more than skiing here. It has France’s longest toboggan run and you can go fat biking, take a gyrocopter flight, and go ice climbing. If you want to party, this place has plenty of options starting from early afternoon at the Folie Douce and later on in the buzzing village. Getting there: The following morning, take the TGV from Paris Gare de Lyon and arrive at Moutiers. From there, it’s 45 minutes by bus or taxi. Set in the most breathtaking scenery imaginable, Alpe d’Huez has 150 miles of superb and varied skiing, shared with five villages. In the main sector, there’s a large network of easy blue runs, making it a good place for beginners to learn. The variety of the terrain means that there’s something for everyone here, and the extent of the slopes means that you can go off in a new direction each day to try something different. From many skiing spots, you’ll look onto magnificent views of the Oisans Valley. And for those who love powder, Alpe d’Huez offers incredible routes. Head up early before the crowds, over to the "Sarenne" run, which has some beautiful lines a short distance away from the main trails—on either side. The runs also tend to stay beautifully quiet, especially at the outlying sectors of Vaujany and Auris en Oisans. When you’ve gorged on the terrain, there are plenty of mountain restaurants —charming places such as Le Bergerie, where you can clamber inside to find steaming plates of tartiflette and beaming faces. Getting there: The following morning, take TGV from Paris Gare de Lyon and arrive at Grenoble. From there, it’s 50 minutes by bus or taxi. It’s no surprise that La Plagne is one of the most popular resorts in the Alps. With 10 villages accessing 250 miles of ski terrain, La Plagne is able to offer a choice of purpose-built, ski-in/ski-out convenience, and old-world charm of traditional villages. The slopes are linked with Peisey Vallandry and Les Arcs by the epic Vanoise Express gondola, and there’s plenty of high-altitude runs, right up to the lofty 11,200-foot summit of Bellecôte. The resort is famous for its Olympic bobsleigh run, which you can choose to hurtle down for an adrenaline rush, and it has a range of other non-ski activities. These include climbing an ice tower, dog sledding, fat biking, and air-boarding. During Easter, the resort puts on a festival called Sublicimes. This event features music and activities around six summits in the resort, with a huge ice grotto, pop-up hot tubs, magicians, and other performers. Getting there: The following morning, take the TGV from Paris Gare de Lyon and arrive at Aime la Plagne. From there, it’s 20 to 40 minutes to the resort’s villages by bus or taxi. Close to the Cluses train station is the pretty village of Les Gets. Charming chalets and inviting restaurants line the streets here, making the village chocolate-box cute. Les Gets is part of the huge Portes du Soleil ski area, linked with Morzine and Avoriaz, and the skiing possibilities are endless. The resort is also blessed with great local slopes at Mont Chery. You’ll find that these remain remarkably quiet, retaining untracked powder for far longer than other areas on the main circuit. After a day on the slopes, you can sample chocolate from around the world at a tearoom, Le Chalet du Chocolat. The tourist's office organizes lantern-lit snowshoe walks in the evenings through the local woods. The resort introduced "Sled Dogs"—a winter sport originating from Norway where skaters wear snow skates (called Sled Dogs)—to descend the slopes. Getting there: The following morning, take the TGV from Paris Gare de Lyon and arrive at Cluses. From there, it’s 25 minutes by bus or taxi. Located a short distance from Lake Annecy, Le Grand Bornand is a wonderful yet relatively little-known ski resort, sharing the same ski pass as La Clusaz. You’ll find that the slopes have some superb intermediate terrain, plenty of accessible off trails—as well as exemplary beginner zones. The village is full of lovely old chalet buildings and has a family-friendly buzz about it. The resort is the birthplace of Reblochon cheese, so aromas waft out of the numerous Savoyard restaurants in the village and dotted conveniently on the slopes. The resort offers "Snooc," which is an activity that combines ski touring and luge, and gives you the chance to glide down untouched areas adjacent to the slopes. Le Grand Bornand has seen generations of French and Swiss families learn to ski here, and they keep coming back. Getting there: The following morning, take the TGV from Paris Gare de Lyon and arrive at Annecy. From there, it’s 35 minutes by bus or taxi. One of the most important things to know about Paris stopovers is that although you stop your journey in Paris, as long as you stay less than 24 hours, your journey can count as a "through journey." This means it's valid for a Connection Fare, which is where the Eurostar and the TGV journey count as one combined. This saves you money instead of booking the legs separately. You can easily book these trips over the phone, by call-center staff or rail-booking experts who can scan rail systems easily for lower fares. They can also suggest train combinations that would save you money or advise when an upgrade would cost a little extra. Hôtel Bel Oranger: Located at 9 Rue d'Austerlitz, this hotel is just a few minutes from Gare de Lyon and the Gare d'Austerlitz. Hôtel Palym: Found on 4 Rue Emile Gilbert, this hotel is a one-minute walk to the Gare de Lyon and near the Notre Dame Cathedral. Hôtel Viator: Located at 1 Rue Parrot, this hotel is close to Montmartre and Sacre Coeur.